Why bring this up now? Afghanistan and Wall Street. When you are used to peeing or pooping standing over a hole in a ground, when you pee and poop standing on the toilet bowl, it tends to make a dirty bathroom, when you don't sit when you sh*t. Toilet protocol needed to be taught in Afghanistan. And that's the difference between the leaks on Wall Street, and in the bathroom. Because the only bugs in Afghanistan bathrooms comes from leaks on the floor, and not from bugs in the ceiling. 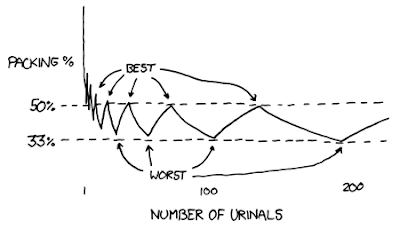 And it looks like urinal protocol has been violated on Wall Street! Its the Fed's new formula! what's funny is i got out of MNI on a loss and it blows up 20%. yahoo message guys spreading rumors that GCI will be bought out...have you heard anything? Haha I love this article, I'm goin to show it to my behavior economics professor!